Positively Calming is psychoacoustically designed music which has been clinically tested on 150 dogs. Not only does it have a scientific pedigree, but Through a Dog’s Ear soundtracks have become the standard for canine music therapy. Why? 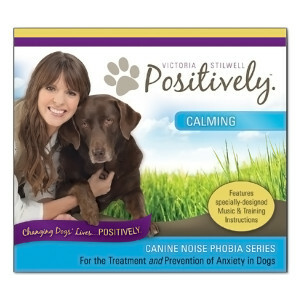 Because it consistently works to relieve canine anxiety. Dog’s Ear music is intentionally selected, arranged, and recorded to provide easeful auditory assimilation. Three primary processes are used to accomplish this effect: Resonance, Entrainment, and Auditory Pattern Identification. To learn more visit www.CanineNoisePhobia.com. When a dog feels stressed, it experiences a number of physical changes. Heart rate and blood pressure are elevated and breathing becomes more rapid while energy is diverted to other muscles that need it most for fight or flight. Digestion is suppressed, growth and muscle repair is halted, immunity inhibited, and senses are sharpened. All of this happens within a matter of seconds and allows the body to operate at its optimum level to ensure survival. This process is important if a dog’s life is in danger, but constantly experiencing these physical changes can put a lot of pressure on the body and increase stress levels, leading to long-term illness. Please note: This music is not recommended to be played in the car. While it will calm dogs, it may also make drivers drowsy. About Through a Dog’s Ear.